Nico: Here is my attempt to this exercise. A play at a is definitely too slow and does not achieve much in the corner. So I hesitate between the 2 big points b and c. I go for c, since this is a point White will want to play, and it claims some territory as well. It looks like a nice way to approach White in the lower right, to kind of settle the upper right black group and to begin to press against White. 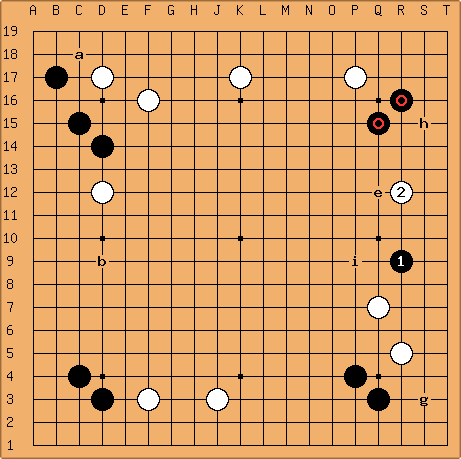 Then I also assume that if White plays around b, there is still some place for the lower left black group to extend. Anyway, I am not that confident with this one. Any comments are warmly welcome. Dieter: I think you are right about this one. The white stone on the left is high, so it takes a couple of moves before you can really speak of an attack. By then, the stone has become light. So White can really ignore Black b. The two stones on the right, however, are twice as important, and one of them is low: this group is definitely heavier and a more interesting object for attack. Taking White's responses to the proposed moves into account, one comes to the same conclusion, but I have understood that reading more than one move ahead is not the purpose of these exercices. DJ: Black 1 here is at the same time an extension from the marked stones (may I say a natural extension?) and a pincer to the two white stones, played on their shape point (I suppose). A double purpose move. I wouldn't say it claims territory, not yet at least: but if the attack keeps White busy it may be that Black takes terrritory naturally while attacking. White can also dive in the corner to settle the group under attack, in which case Black must be careful, as the pincer/extension leaves room for invasion. QWerner What is with B L3 (c)? W has somehow to awser for saving the lower group. If W awser, black R 11 (d) looks fine. Arieh: looks bad to me after . Maybe I'm missing some good follow up for black. It looks like white's lower right group can live easily either with g, extending toward the center, or maybe something like i. White can also live at the middle right, I think, since h and extending toward the center look miai. If this is the case than just encourages white to take territory without giving up much. What am I missing? Harleqin: This is a very good question. My feeling is that Black can just jump to 'i', take a few points in both corners on the right side while pressuring the white groups, and finally switch to the left side. This doesn't mean a 20 point win, but it puts Black ahead. Being able to live with two groups is not a great strategy. Arieh: What about playing one or two rows up? It makes much more territory for black at the top right and gives up relatively less territory to white on the bottom right. On the other hand, I suppose it leads to a more settled shape and less influence for black into the center. xela: What you are missing, Arieh, is that white has weaknesses all over the place whereas all black's groups are strong. If a fight breaks out, it will have effects on the rest of the board that are much more important than the few points of territory on the right. For example, if the game continues this way (possibly not the best moves, but something that is easy to understand) then all of the marked white stones are weak (and , and aren't alive yet): sooner or later something will crack. Herman Hiddema: Even better would be to play at a, then after white plays at b, black can play at c. This denies white a base for his group in the lower right. 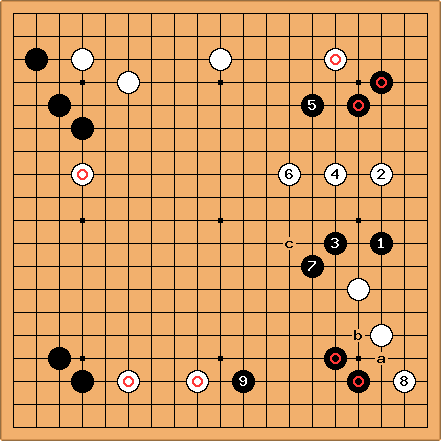 Since the marked black groups are strong, this then turns into a very favorable battle for black. The , , c group is the only black group that is weak, but white had weak groups everywhere. Arieh: Thanks guys. A great lesson in thinking globally. Wouldn't the at a move give White the option of playing at c shutting in and giving White a good position on the side? N? : A move like Q17 is a very big move yet it's not listed in the options. White can strengthen itself by playing 1 making 3-4-3 tent but compared to black Q17+sente it is puny. I would play Q17 and then go from there. White still has plenty of weaknesses to worry about and Q17 is practically sente since if white doesn't reply black has the severe pincer. imo white is still very weak and loose so strengthen yourself first then attack the weakness would be my approach. Urgent before big? Does this make any sense? Just my 2 cents if anyone cares to reply. On to Fuseki Exercise 9.